Cwtch Camping is set amongst the rolling countryside of South Wales in an area famed for its spectacular coastline and great beaches. It’s a secluded spot near Haverfordwest, and is within easy reach of main cities such as Bristol and Cardiff. The simplicity and pleasure of secluded, off-the-grid living can easily be found here amongst three acres of beautiful woodland. The accommodation is best described as Scandinavian-style cabins, which are constructed using locally milled and sustainable timber. Insulated to keep warm on cold nights and stay cool during the summer, they’re beautifully crafted structures which are delightfully basic yet amazingly comfortable and cosy. The cabin I experienced during my stay was well decorated and furnished, with whitewashed walls and antique furniture which added to the atmosphere and rustic sense of homeliness. Although this is at heart a camping experience, they’ve really gone the extra mile to make it a warm, comfortable and cosy experience: so much care and attention has been put into decorating and furnishing the cabins. There are three cabins and one bell tent in the Cwtch Camping field, ranging from a double occupancy (with a very comfy double bed!) to the larger cabin which accommodates three adults or two adults and two children. There is a fantastically well-stocked kitchen and cooking area, with a range of utensils, pots, stoves and plates. Tea and coffee is supplied, and in addition a welcome hamper is fully stocked for your arrival. 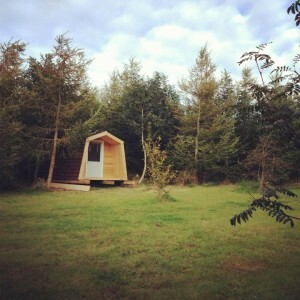 There is a shower cabin in the same field, and you can be sure of running hot water at any hour of the day or night! Cwtch Camping is a real retreat – excellent if you want to get away from it all and escape to the proper Welsh countryside. It’s brilliant for anything active – walking and cycling are especially encouraged and the site offers bikes for hire. The nearby beaches of Broadhaven and Little Haven are worth exploring and only a short cycle ride or drive away. The excellent (and award winning) pub The Swan serves some of the very best food in the area. A great getaway of couples and anyone wanting to explore the area’s beautiful countryside and coastline. It’s also perfect for groups – a large campfire and stove which is provided offers a focal point and it would be a good place to host a barbeque or gathering of close friends. There’s no getting away from the fact that this place is beautifully secluded, so you have to be prepared to source your own entertainment, and be prepared for the weather…!